Steiff Belle Teddy Bear Discounts Apply ! Made from The Finest High Quality Antique Cinamon Mohair. It last tolled on Feb 22 1846 in Honour of George Washington's Birthday. But the Symbolism of the Liberty Bell in Philadelphia's Independence Hall still ring's true today. 5-way jointed with Boot Button Eyes and stuffed with Safety Filling, and with gold-plated "Button in Ear" and Surface Washable. 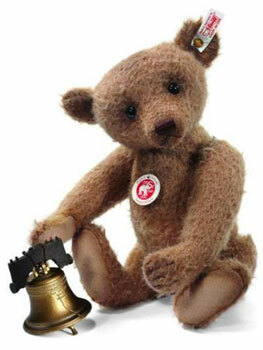 This Bear is part of Steiff's 2012 Exclusive range.